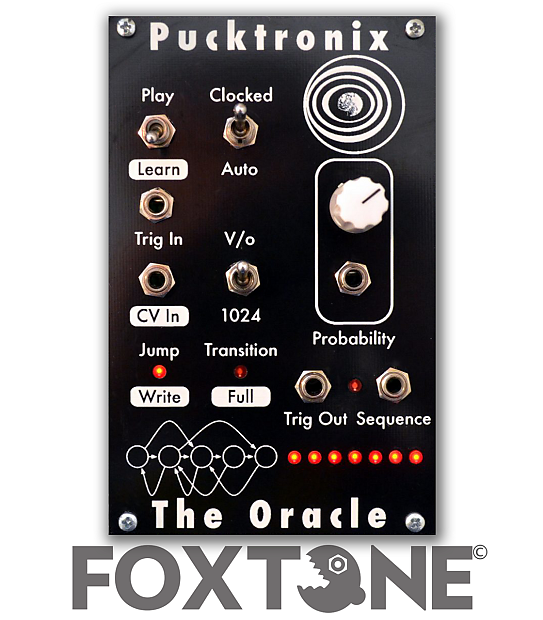 The Oracle is the first machine learning synthesis module. The module is a control voltage (CV) based on a machine learning algorithm that can detect repeated patterns in a sequence. The device learns a control sequence (think a melody) and produces variations on that initial sequence in a musically meaningful way (think theme and variations). The algorithm builds a model of the syntax of the sequence that then allows for the generation of new, closely related sequences. These new sequences follow the logic and structure of the original sequence, but with different orderings. Technical Overview • 16 HP. • 32-bit Cortex M4 processor, running at 96 Mhz. • 12-bit CV conversion. • 12-bit CV output. • Buffered CV (approx. +/- 5V) and Clock (0 - 10V) input and output. • 10 Panel LED indicators.